This report sheds light on the racial aspects of the 93 million unbanked and underbanked adults and children in the United States, disproportionately people of color, and suggests innovative ideas on how to include them in the financial mainstream. Each year, poor and working class people hand over $89 billion worth of fees and interest to Wall Street, by way of alternative financial service providers such as check cashers, pawn shops, payday lenders, etc. These fees are levied on those that can least afford it and if addressed, could provide a powerful stimulus opportunity for the people and communities that need it most. 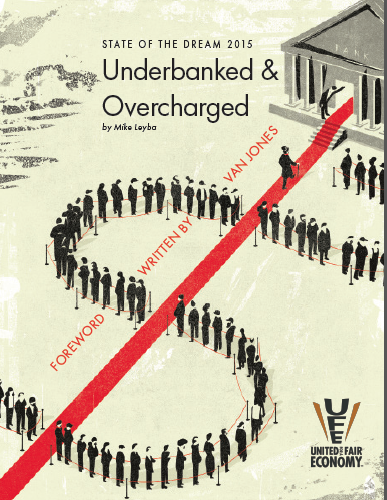 This report proposes several solutions to this problem, including utilizing United States Post Office branches as a mechanism for financial inclusion, as has been done in the past, as well as advocates for expanding public-private partnership programs that work such as BankOn or private lending circles. The State of the Dream report is released annually by United for a Fair Economy. United for a Fair Economy is a national, independent, nonpartisan, 501(c)(3) non-profit organization that challenges the destructive effects of concentrated wealth and power and supports grassroots movements for greater economic equality.